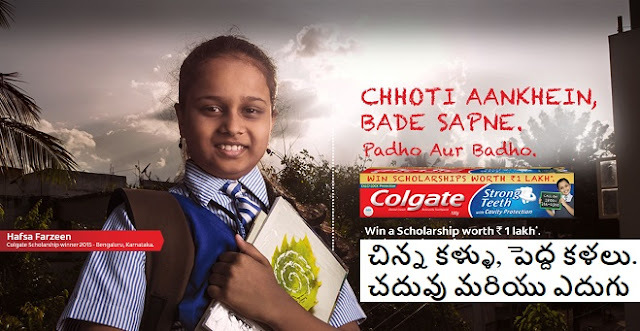 Colgate Scholarship Offer 2016-Win a Scholarship worth 1 Lakh: Colgate Palmolive India Limited, the market leader in Oral Care, announced the commencement of its national scholarship initiative. It is an effort to offer a national platform that provides impetus to children who aspire to bring a progressive transformation in their lives. The initiative offers families a chance 1 lakh and it will be available at website. Scholarship offer aims to furnish over 200 scholarships of up to Rs.100,000 across the country. The Colgate Scholarship offer was first introduced in the year 2009. Till date it benefited over 1200 families by providing opportunities towards better education and brighter future. Secure your child’s future today. Win a Scholarship worth 1 lakh*- Healthy teeth and a secure future - with Colgate: Your child deserves to get the best of education and have a bright future. That is why, Colgate Scholarship Program has, once again, set out to bring you one step closer to fulfilling your child's dreams. All you have to do is, buy a Colgate Scholarship pack, give a missed call on the number printed on the pack and stand a chance to win a scholarship worth 1 lakh! The Participate in the Colgate Scholarship offer, consumers have to give a missed call on a toll free number printed on the pack of Colgate Strong Teeth toothpaste. The participants have to answer a simple question on Oral Care to avail to the opportunity to win the scholarship. The terms and conditions of the Scholarship Offer, which is open from .................... are available at www.colgate.co.in (Purchase of pack is not mandatory). Your child deserves to get the best of education and have a bright future. That is why, Colgate Scholarship has, once again, set out to bring you one step closer to fulfilling your child’s dream. All you have to do is, buy a Colgate Scholarship pack, give a missed call on the number mentioned on the pack and stand a chance to win scholarship worth 1 Lakh! Now every Colgate Scholarship pack helps your child move closer to their goal. Get free audio/video courses from BYJU’s worth 999/- inside every pack. Go ahead, buy a Colgate Scholarship pack and secure your child’s future today.